Home » Blog » What is the Impact If Your Business IT Operations Choked? Many downtime events may have often been heard since 2016 to date. Both overseas and in Indonesia, downtime has taken place in big business and popular in IT community. The news of downtime certainly undermines business reputations. 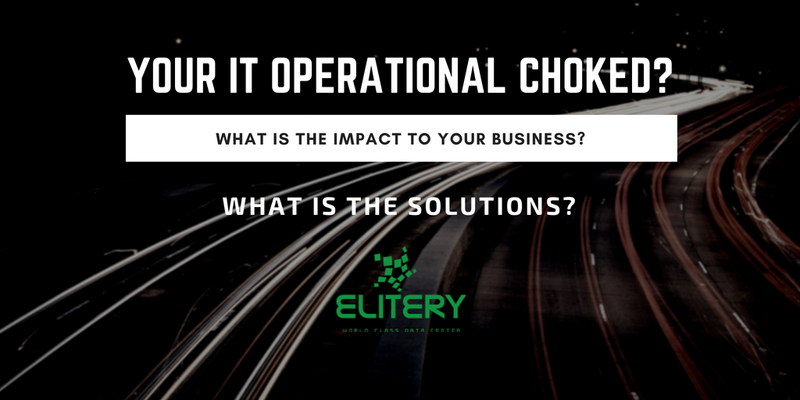 So, if your IT operations faltered what is the impact on your business? Downtime is a condition in which all business operations are paralyzed, but there must be more on to watch by all company leaders, IT operational conditions are not smooth or choked up. For example, slowdown on data communication network, decreasing application performance, and so on. The existence of malware that has been secretly infiltrated into your IT network system and burden the performance of your IT infrastructure. Businesses experiencing such those things above will have an impact on operational performance. We can imagine if IT operations are stuck on a business that serves buyers in retail stores, of course, the business unit can not optimize its revenue. Even for a business that runs 24 hours without stopping, such as marketplace and fintech, IT operational shortcomings will further increase the inefficiency in your business. IT operations hamper does not have a direct impact like downtime, but this will hamper your business development. Business continues to face competition, information technology is always growing. The essence of digital transformation is to provide better service to consumers and business operations more smoothly and quickly. Thus, the company can continue on the right track. In today’s Digital Age, people increasingly feel they do not have much time. Whether to wait for application loading or to queue at a retail store. This is consumer behavior in the prevailing digital age. IT leaders should start detecting all the factors that are causing the loss of your IT operations. Failure to detect and manage such things can be bad for your company. Elitery as TIER III data center provider with availability status above 99.9% and has been certified by The Uptime Institute, also provides information technology management services. You can count on Elitery managed services to prevent your business IT operations from faltering. Provides bandwidth from multiple operators, so that if one network provider goes down, your business operations are not interrupted. And this is without you having to pay double for the data communication network connection costs. Provide remote support in case of interruption to one of the IT infrastructure components used for operations. So trouble shooting and patching can be done without having to wait for technicians to come to each business location. EliVault solutions are already widely used by Fintech businesses and financial institutions in Indonesia. EliVault provides protection for your system and data through a backup site. This backup site run on cloud, so the cost is very affordable for SMEs. Your data and backup system will be in a TIER III Data Center certified by Uptime Institute, PCI DSS, and ISO 27001. All your data is encrypted and protected by multi factor authentication. In addition, EliVault has been using technology to detect malware behavior to ensure that your stored data is always in the best condition. So, when needed for data recovery or migration, the process can run smoothly. Do not let your IT operations run more slowly. Enable the Elitery team to manage your critical IT infrastructure.